The Organisation of Women in International Trade (OWIT) is set to host its 18th conference in Nairobi, the first in African soil. Themed, Bridging the Gap; empowering businesses to go global, the conference will be a two-day event to take place on the 24th and 25th of October in Nairobi. Day one will be a capacity building workshop for local women entrepreneurs seeking to take their business across borders. Day two will feature trade practitioners and policymakers from around the world and will address best practices for shaping cross-border commerce. The speakers will share insights on what’s next for the future of trade, and the evolving role of women in international trade. This will be the first time in history an OWIT conference is held in Africa. There’s a lot of interest globally about Africa’s emerging entrepreneurship ecosystem that’s driven by small and medium-sized enterprises, more so by women. Having the OWIT conference in Nairobi will be instrumental in enhancing the capacity of women-led enterprises to accessing global markets. Women drawn from various OWIT international chapters, financial institutions and policy makers will create dialogue on core factors that make it difficult for women in business to access opportunities beyond the boarders and enhance their global competitiveness. Women entrepreneurs often have limited access to resources such as finance and advisory services. Many SMEs do not understand what it takes to make their products ready for export. This impedes their ability to meet international standards for export. One of the benefits of being an OWIT member is if you are travelling to a country with an OWIT chapter, you can use the network to get business and advisory services. OWIT is committed to creating opportunities for women to connect to global markets. The OWIT conference has an exceptional program and array of speakers lined up for the conference. Some of them include Susan Baka, the President of Bay Communications & Marketing Inc. and the Ontario Representative, Trade Facilitation Office Canada who once served on the Canadian Minister of International Trade’s SME Advisory Board. Mucha Mlingo, who is Managing Director of Premier Training Services Ltd, as well as the current Chairperson of OWIT Nairobi Chapter. Jennifer Diaz, the President of OWIT International and founder of Diaz Trade Law, a law firm specializing in Customs and International trade law. Delivering the keynote speech will be Flora Mutahi, CEO of Melvins Marsh and Chair of Kenya Association of Manufacturers. A variety of sponsorship opportunities are available at the 2018 OWIT International World Conference. This will be of beneﬁt to both the workshop and conference attendees as it provides them access to business leaders, policy makers, and trade experts from a wide array of international organizations as well as possible funding. The Conference has garnered an esteemed list of sponsors some of whom will conduct workshops during the event. UPS, the world’s largest package delivery company will be conducting a workshop to help entrepreneurs learn how to package their goods and services for export. Other sponsors include international brands like Thompson Reuters, Huawei as well as small business sponsors like Laeton, Global Training Centre and Boomerang Carnets. There are several benefits to attending the 18th Annual OWIT Conference. Delegates will explore how to enhance women’s capacity to engage in international trade. Speakers will address the constraints in accessing new markets, and aspects to build women’s capacity to benefit from cross-border trade. During the conference, action-oriented conversations that result in greater female participation in global trade will be initiated. 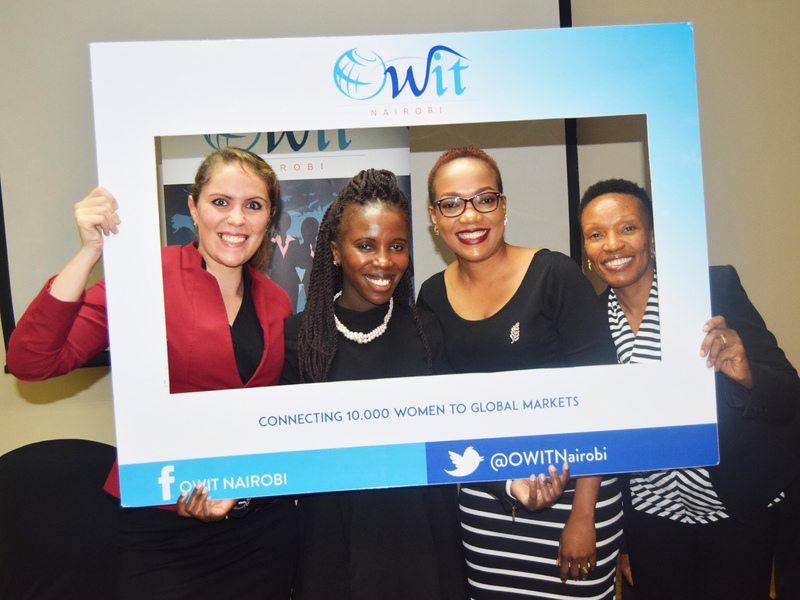 OWIT Conference Nairobi will foster conversations about obtaining alternate, competitive sources of investment capital required for female entrepreneurs to up-scale their businesses. Attendees will be provided with a platform to connect and network with International OWIT members, women from across traditional, emerging, and developed markets. Participants will get to understand the capacity of domestic and international organizations to dismantle the trade challenges identified by stakeholders. OWIT Nairobi will refine the commitment and pledges from stakeholders for the key messages that emerge from the conference through the signing of agreements.